Field hockey tri-captain Ali Savage ’15 wasn’t the only person that fell in love with Hanover on her visit from Australia. Savage was born and raised in Orange, New South Wales, Australia, a small city a few hours inland from Sydney, and she grew up in a family of sports fanatics. “It’s been a big family thing, and it’s a big part of my culture as well coming from Australia,” Savage said. Her mother was a swimmer and played field hockey, while her dad was a soccer and rugby star. She has two siblings, an older sister and a younger brother who specializes in skiing. Early on, however, it was clear that Savage had inherited a bulk of her family’s athletic genes. Her focus on field hockey began when she transferred to Pymble Ladies’ College in Sydney. She was enrolled in the Pymble Elite Sportswomen’s program, cultivated specifically for students that demonstrate unique sporting talents. The program helped Savage advance her athletic talents while still maintaining an academic balance, an asset to her future career at the College. A series of coincidences would help Savage find her way to Hanover. Former field hockey associate head coach Andy Smith used his British background to search overseas for a forward. The previous season, the Big Green had lost seven of its 17 games, with 10 games decided by three goals or less. Putting the ball in the back of the net was a priority for the team. As it turned out, one of Smith’s close friends coached an English team that toured in Australia and faced Savage on both the high school and club circuit. When Smith came knocking for suggestions, Savage’s name quickly popped up as a standout athlete. Savage graduated from her high school in October and visited campus in November. As a result of the scheduling differences in schools, she was unable to join the team until August of the next year. Considering her weather preferences, it’s surprising that Savage found herself in Hanover in the first place. Her visit brought her a first taste of late fall New England weather. As a result, Savage spent most of her visit indoors trying to find heaters. She said that she knows the location of virtually every heater on campus, and that no outdoor practice in the winter was one of the biggest selling points Dartmouth could offer. With most students away for the winter interim period, Savage was only able to meet a few of the other athletes. She said the fact that they came to talk and visit with her over coffee during her trip impacted her decision to join the team. The academics were also a big part of Savage’s decision. In contrast to Australia’s college system, which more or less requires that students know their field of interest prior to enrollment, the College’s flexibility gave Savage much more freedom. Savage graduated this past winter with a degree in neuroscience. As with most international students, Savage found adjusting without her family to be one of the biggest challenges. Savage’s father was able to visit once her freshman year, and her mother came to Hanover for two weeks during her junior year. In comparison, her senior season was incredibly special. Savage said that she never realized how important minor details such as knowing the 50 states and being familiar with basic geographical regions were in making friends and relating to new people. “One of the hardest things of adjusting was just to reform a support network and familiarize yourself with being pretty far,” Savage said. In terms of her field hockey career, Savage admits to being afraid and intimidated her freshman season. Nonetheless, Savage quickly came onto her own in the next few years. Her freshman year, she was named to the All-Ivy Second Team and took home three Ivy League Rookie of the Week awards, a league high. That season, the Big Green snapped Princeton University’s 24-game win streak against conference opponents, picking up a 2-1 win in their Ivy League opener. The win was the Big Green’s first since 2004 against the Tigers, who have won or shared the Ivy League title in 20 of the last 21 seasons. At the end of her sophomore season, she led the team in scoring with 10 goals and six assists, picking up a unanimous selection for the All-Ivy First Team award. The team also found success, finishing second in the Ivy League behind Princeton. Savage was quick to attribute her growth to the development and focus programs that the College provided. “One season, one year of that, and I think that any field hockey player is going to grow immensely,” Savage said. Savage would go on to lead the team in goals the next two years as well. This past season, she was unanimously named to the All-Ivy First Team for the third time, becoming just the sixth player in College history to receive three first-team awards and the first three-time unanimously selected first-team member for the Big Green. 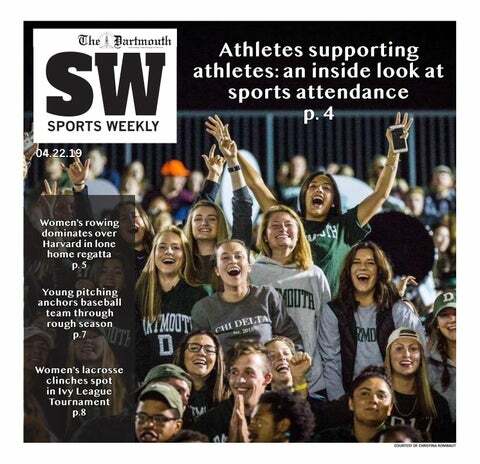 “It’s an honor to have any sort of recognition when it is associated with the Dartmouth field hockey team,” Savage said. Aside from statistical accolades, Savage, above all, has a devoted passion for the game and for representing the Big Green. One of the two most memorable moments of her career — the other being the Princeton game her freshman year — was the final game of her senior season against Cornell University. While the team was unable to come away with a victory, Savage was grateful to have her entire family there to watch her wrap up her career. Savage recently returned from a trip to Spain and London where two of her closest friends from Australia live. She plans to walk at graduation at the end of the spring. As for her future, she has had to make some tough decisions. Savage said she was torn between returning home to Australia to play at a higher level on the club circuit and staying in the United States. Currently, she plans to stay in the U.S. for a couple of years and settle into a career. While her options are limited by her visa restrictions, Savage is looking to move to a warmer climate after experiencing one of the coldest winters of her life. “I’m excited about exploring the other side of what Dartmouth has given me, which is an incredible education and a renewed passion for neuroscience,” Savage said. After visiting London, she is also considering taking advantage of their two-year work visa granted to Australians. No matter where she heads, Savage will be sure to take advantage of every opportunity.